Because of their limited resources, indie games often have to rely on a specific ‘hook’ to compensate for their smaller scale. 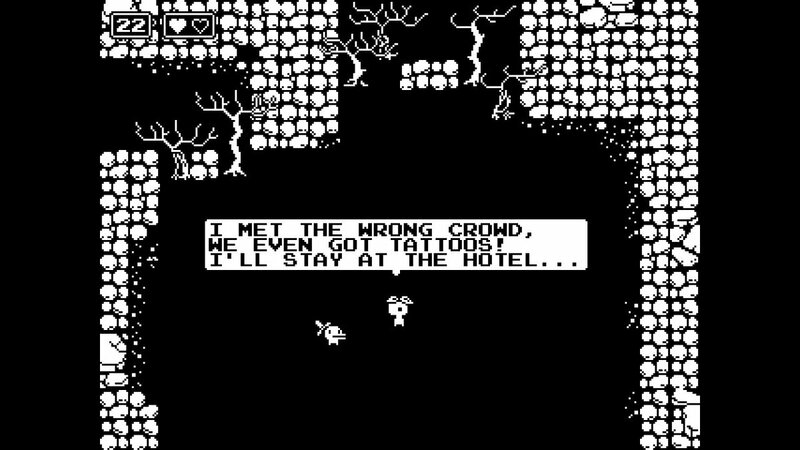 Minit is one such indie game, and one whose charm stems from its particular gameplay hook which, in a weird way, seems to be a parody of indie games with said hooks. Though it’s mostly modeled after 2D Zelda adventures, Minit also feels equally inspired by WarioWare. 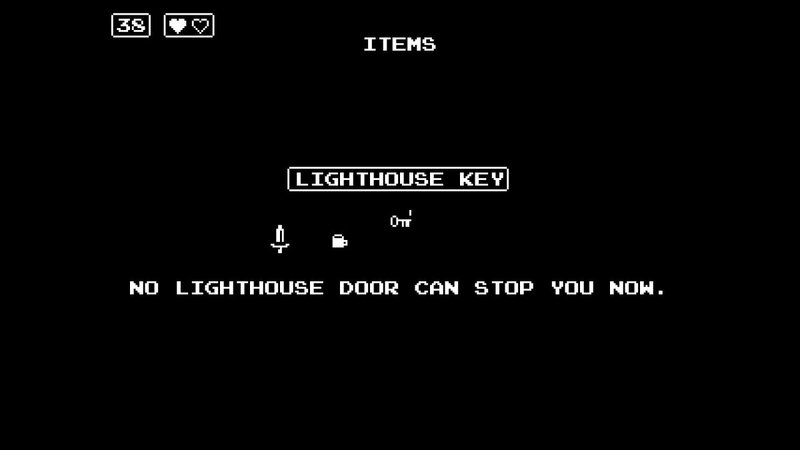 That’s because the aforementioned ‘hook’ of Minit is that the player character dies and returns to a checkpoint every sixty seconds, keeping whatever items you claim in a given life, meaning that you’ll make incremental progress at a time. It’s a fun and charming little gimmick, as you rush to get even a single objective done within the allotted minute. Your house is your initial checkpoint where you’ll respawn after every minute, though there are other houses (as well as a hotel and a trailer) that become your new checkpoint when entering, thus serving as shortcuts to different objectives. As stated, Minit works like a bite-sized Zelda. The player character (who resembles a Tamagotchi creature) travels the land, completes puzzles, and helps others to gain items. The ultimate goal of the game is to stop a factory from producing cursed swords, which are the cause of the “one minute of life” curse. With your own such cursed sword, you fight off enemies, but the character can only equip one primary item at a time, so for certain lives you may have to replace your sword with another item (found right outside your current checkpoint once collected) in order to solve a particular puzzle. It makes for some fun puzzle-solving as you try to use every last second effectively. Perhaps the game’s greatest strength is how the setup allows for players to tackle it in different ways. Only a handful of items need to be acquired in order to stop the factory, but others still exist out in the game’s world to be collected, along with additional hearts and gold coins. Basically, even though the game is already served up in bits and pieces, it works in such a way that should really appeal to speed runners. On the downside, while Minit may be fun while it lasts, it doesn’t last very long, with most players probably able to complete the whole thing in about two hours. And unless you are really into speed running or are a completionist, I can’t imagine Minit would have too much replay value. While it may seem like unfair to criticize the graphics of an indie game of limited resources and budget, the fact that Minit’s graphics lead to me dying more than any enemies seems to be a bit of a problem. Although the character designs are charmingly simplistic, the black and white graphics can often lead to objects blurring together, and I found my clock hit ‘0’ quite often simply because I couldn’t tell where I could and couldn’t go. Even the puzzles themselves can, at times, be pretty vague with what you’re supposed to be doing. Minit may be something of “Zelda meets WarioWare” in concept then, but it lacks the depth of the former, and the latter’s instant communication. Minit could be better polished then, and it may not have enough substance to it to make up for its short playtime. 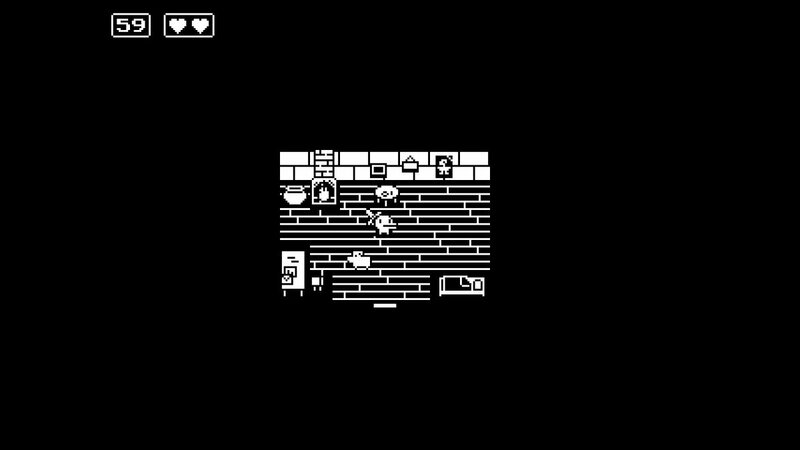 But all things considered, Minit is a fun little experiment that strips the Zelda template to its barebones minimum, and should leave those with the interest finding scurrying to find ways to save every precious second.